While the second Global Atheist Convention at the weekend was a highlight for some, it disappointed others. Some would be attendees stayed away because they could see that the dominance of comedy and derision would exclude any serious or productive exploration of the issues. Others went along prepared to live with the frustration, or perhaps enjoy the event as if it was part of this month's Melbourne Comedy Festival. Last Monday's ABC TV Q&A debate between Richard Dawkins and Cardinal George Pell represented a different kind of trivialisation in that it was promoted as a fight rather than comedy. In a sense this is much closer to the contest of ideas that we would hope to see in an exchange between a believer and an unbeliever. But it lacked the mutual respect that any form of dialogue requires. The Sydney Morning Herald's Leesha McKenny referred to the 'barely concealed mutual disdain between Dawkins and Pell', implying that hostility was the defining characteristic of the event. Neil Ormerod also made this point in Eureka Street last Wednesday when he contrasted the Q&A 'match-up' with the 'gentlemanly affair' that was February's Oxford debate between Archbishop of Canterbury Rowan Williams and Dawkins ('on his best behaviour'). In the shadow of the blockbuster Q&A and Global Atheist Convention was a much more poignant encounter earlier this month between broadcaster Philip Adams and the Jesuit Fr Gerald O'Collins. 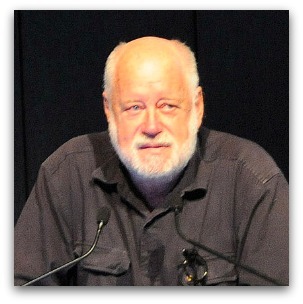 Adams is the longtime (but arguably fallen) doyen of Australia's atheist movement, while O'Collins is one of the English-speaking world's most published and respected Catholic theologians. Such an instant bond need not soften the positions held. And it didn't. Adams attempted to chisel away at O'Collins' belief in the Resurrection as an actual event. O'Collins stood firm in declaring the physical Resurrection 'central and obvious' to him in his life. Adams countered by admitting that while he does live in a universe that is ultimately meaningless, he's very happy, and life as an unbeliever 'is not too bad'. In view of the natural bond between Adams and O'Collins, it seems there could also be an affinity between the one-eyed Dawkinsonians at the Global Atheist Convention and fundamentalist believers of all religious faiths. It's a pity that they are more likely to engage in fistfights than dialogue. Or maybe not. Michael, you should not be surprised at the ABC Q&A program. It is trivial and celebrity nonsense and is part of the ABC's dumbing down of mainstream programming to be the same as the anti-intellectual commercial TV and radio. Phillip Adam's 'Late Night Live' program is the best intellectual program on radio and TV and the only ideas program worth listening. Adams is an excellent interviewer because he listens to the interviewee and respects their opinion. Most other radio and TV interviewers are only interested in asking loaded questions designed to get a cheap headline. I heard the Gerald O'Collins interview and it was excellent listening. Perhaps some clarity in the Theist/Atheist debates would come if 5 different positions were acknowledged. 1. Personal belief in God. 2. Belief in the concept of God as proposed by any particulat "religion". 3. Agnosticism : belief that we cannot know whether there is a God or not. 4. Atheist '1'; a rejection of the concept of God as proposed by any particular "religion". 5. Atheist '2'. Rejection of all concepts of God; i.e.,a denial of any transcendents being. Agnosticism can be reconciled, in the sense that it is pointless to debate the existance of God unless we can agree on what is meant by the word 'God', and as Thomas Aquinas noted, the closest we can come to an understanding of God is to realise that God if far beyond the limits of human understanding. The concept of God proposed by any 'religion' is an attempt to contain in human words or symbols a spiritual reality that cannot be so contained. Hence it must contain flaws, which can be rightly rejected without denying the reality of God. Extreme Atheism, or total rejection is rare and lacks credible positive reasoning. The discussion between Dawkins and Williams demonstrates the capacity of the former for mutually respectful dialogue with religious leaders. On the other hand, Pell's position on global warming shows that he is no respecter of scientifically-determined truths. Thus was set the tenor of their 'Q&A' encounter. That said, it is insufficient for atheists to argue the non-existence of God; they need to show that secular ethics can provide adequate moral guidance, that secular rituals can meet the human need for communality, that secular charity can meet human needs for sharing. The greatest challenge for evangelical atheists, however, is the search for meaning for a finite life. Yes, the circus organised in Melbourne is a money spinner for the AFA, but they have no ideas for what to do with the money afterwards, beyond pathetic attempts with billboards and bus advertising to state the bleeding obvious, to some. Nicholls (the AFA emperor) thinks he has no need to follow up with any actions at all and that all that is required is for everyone to realise that there is no God, indeed, no gods, and atheism will become the natural order of the day. For whatever reason, millions of people are so scared of life that they think they need to believe in gods to survive, and that is not about to go away, sadly. Australian comedians are a lacklustre lot, in the main, and when their humour relies on swearing and abuse, it ceases to be humour of any variety. That said though, there was some serious stuff being debated there, but not by Dawkins et al. Marian Maddox, Leslie Cannold and Fiona Patten all spoke, in part, about the danger of politicians allowing fundamentalist Christian activity to take over public schools, particularly through the abuse of the school chaplains scheme. Cannold spoke about the need to clearly separate the state from the church, something the AFA has no idea about. If the AFA had any purpose at all, it should have been funding and promoting the Williams High Court challenge to Commonwealth funding of chaplains, followed up by a series of court actions against the imposition of religious instruction in state schools in its current format, but no, Nicholls and the AFA are above actually contributing to action, beyond organising a total circus. As for the author bleating about Dawkins being a fundamentalist, he is not at all but he is attacking, in his own way, those fundamentalists who Maddox, Cannold and Patten know are being given a free kick by politicians like Abbott, Gillard, Garrett and Rudd, to say nothing of Howard when he was there. Perhaps if more attention were paid to the source of Dawkins' angst by such as the author of this piee, and Scott Stephens from the ABC 'religion' blog, we could all progress a little in these matters. It's heartening to read of the mutual respect and affection between Adams and O'Collins. It's the only way 'forward'. Fundamentalism scares a lot of people (including myself). It always seems too extreme. And it's difficult to imagine fundamentalist atheists and fundamentalist believers ever bridging the divide. Maybe some lateral thinking needed? In the year 2000, an international survey found that 86% of the world population believed in a God (Christian 32%, Muslim 22%, Hindu 13%, other religions 19%). Agnosticism accounted for 12% and Atheism for 2%. (Current figures may well vary from these in light of more recent reporting suggesting that adherence to Christian and Muslim philosophies is increasing at a greater than others. It is reasonable to suspect that the 12% who make up the agnostic cohort may have very little to offer society when they can't make up their own minds and are not sure what to believe. It is difficult to believe that the 2% who are atheists represent the only intellectual input to society and that the 86% are all intellectually deprived as Dawkins would have us believe.Only 2%? What is all the fuss about? So inconsequential in the big picture that it makes you wonder why so much time and space is wasted accomdating the antagonistic atheist view. I wonder what it is that frightens them about a belief in a superior being. All rather baffling, Holmes! A wise old Irishman once told me that confrontation and fighting rarely came to any good. "Better to walk away," he said, "find the biggest stick you can, and then come back to the controversy. You will usually find that it melts away and things will be far more amicable". Father Gerald O'Collins, Jesuit,Companion of the Order of Australia, carries a very big intellectual stick which in company with the empathy he displays for another opinion can only engender respect. Philip Adams also deserves respect for the same reasons. Pity that so many other participants in the God debate are not remotely in the same league as this pair. Cardinal Pell, Companion of the Order of Australia, is a genuine competitor in the intellectual stakes but perhaps could polish up the empathy a bit! 'Cardinal Pell, Companion of the Order of Australia, is a genuine competitor in the intellectual stakes...' What was he running against John Frawley? The man's views on climate change are appalling. When I listen to someone like Pell I find my atheism coming back to greet me like an old friend. This is a pointless article, affinity can occur between people even if they hold differing views. The reviewer neglected to inform us of the debate and outcome. I agree with Robert Liddy's views that God is beyond our understanding but would propose that their are two types of Agnostic. an Agnostic theist who believes a god, however defined exist but is beyond understanding and thus specific religious faith and and Agnostic Atheist who believes that the concept of a god is beyond understanding and thus by default doesn't exist. I raise this merely as a point of discussion and to assist clarify my own understanding. I have difficulty in any fundamentalist position, whether it be religious or atheist, where intolerance of the other's beliefs underlies how they treat or respect each other. It concerns me that so many atheists celebrate such intolerance as some sort of exhibition of atheism. In a liberal society, it's not a good look. The promotion and trivialisation of such intolerance by 'festivals' or Q&A seems to show a great lack of reflection, ethical thought or regard for the importance of pluralism and the freedom to not be pilloried for sincerely held beliefs that are not foisted on others. Discussion entered into with mutual respect and as a exploration of ideas is what needs to be promoted. Intolerance is a reflection of an attitude that suggests people not like yourself is "the other", and that makes me very uncomfortable indeed. Perhaps Phillip Adams and Gerald O'Collins click so well because, despite fundamentally disagreeing on their fundamental beliefs, they are not "Fundamentalists", either in the American Evangelical sense or in the narrow Dawkinsonian Evolutionist one? Intelligent Christianity and Intelligent Unbelief should be able to meet courteously. Sometimes "unbelief" is a hair's breadth away from becoming "belief": something any intelligent Christian should know. "God is beyond our understanding" is for the believers only. At the end of each day, one of our three adult sons will ask, 'What's on tomorrow?' They don't ask this lightly. They have Down syndrome. Whether they participate in the community, go to work or remain at home depends on what funding we can access.